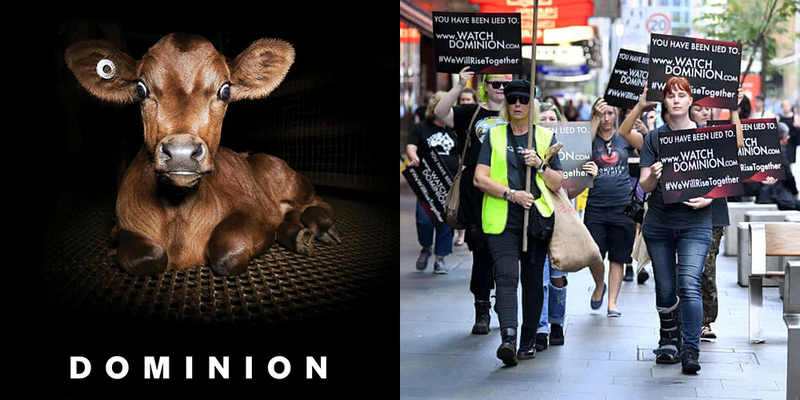 After animal rights activists protesting against the mistreatment of farmed animals in Australia brought Melbourne to a standstill, vegan documentary Dominion has been watched over 55,000 times. Animal rights activists recently took to the streets of Melbourne and brought the city to a standstill as part of a nationwide protest against the shocking mistreatment inflicted on farmed animals. The protests took place a year after the release of thought-provoking vegan documentary Dominion which exposes the truth behind the horrors of the animal agriculture industry. Many protestors at the event carried banners encouraging the general public to watch the film to learn the truth behind the lies spread by the farming industry about the way farmed animals are treated. Vegan media outlet Plant Based News has now revealed that in the 48 hours following the protests Dominion was watched over 55,000 times, whilst Google searches for the terms ‘vegan’ and ‘Dominion’ in Australia increased dramatically. Speaking about the protests in Melbourne to explain their purpose, Dominion director Chris Delforce said: “I’d urge anyone who felt angered or inconvenienced today to watch the film Dominion or at least watch just two minutes of gas chamber footage from inside pig slaughterhouses. That’s how most pigs in Australia are killed. “If you watch that footage you will understand why we had to be there today. The simple fact is that what’s happening to animals on farms and in slaughterhouses is intentionally hidden from consumers, but we believe they have the right to know.